?Chronometro Gondolo - 19 Lines? Patek, Philippe & Cie., Genève, ?Chronometro Gondolo?, No. 168791, case No. 275872. Made for Gondolo & Labouriau, Relojoeiros, Rio de Janeiro, in 1912, sold on December 3, 1913. Very fine, keyless, 18K yellow gold ?Chronometro Gondolo? pocket watch. C. Four-body, ?demi-bassine?, engine-turned and polished, Hinged gold cuvette. D. White enamel with radial Roman numerals, outer minute track with 5-minute Arabic numerals, subsidiary seconds. Yellow gold ?spade? hands. M. Cal. 19''', frosted gilt, patented bridge caliber, 21 jewels, wolf?s tooth winding, gold train, straight line lever escapement ?à moustache?, cut bimetallic compensation balance, blued steel Breguet balance spring, Wilmot?s patented micrometer cam regulator. Dial, case and movement signed. Diam. 52 mm. C. Four-body, demi-bassine, engine-turned and polished, Hinged gold cuvette. 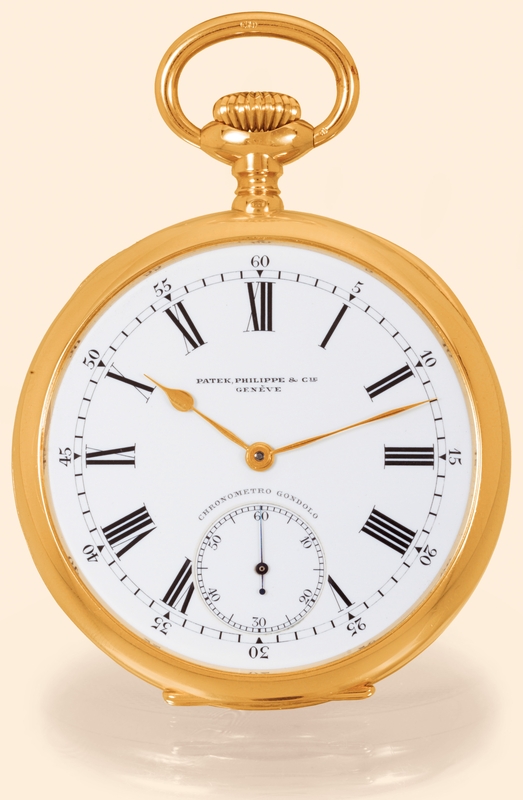 D. White enamel with radial Roman numerals, outer minute track with 5-minute Arabic numerals, subsidiary seconds. Yellow gold spade hands.